Shopping! Gorgeous department store windows, crowds everywhere, Manhattan is a zoo right now. Add to that a dusting of snow and you've got sidewalk mayhem. Remember when you were advised to get your gifts early? Black Friday? No need to panic that you missed it because you were procrastinating -- Manhattan's Christmas Markets are the best way to score that distinctive gift for all your pals. Union Square’s red-and-white tents are a holiday tradition. The square between 14th and 16th streets along Broadway is packed with more than 100 shops and boutiques where you can find gifts for family and friends. The nice thing, too, is that most of the crafts are handmade and you usually won’t find them in a storefront in the city. I love the winter accessories, jewelry and funky specialty items. And, in the tradition of outdoor food markets, there are also welcome treats like hot chocolate and hot apple cider, gingerbread men, crepes and more. And, my favorite food truck has an outpost here: Wafels and Dinges (read my review on Gayot.com). Be sure to try the Spekuloos spread (sort of like crushed Teddy Grahams) on a delicious Belgian liege. New this year, there’s a Market Concierge to help you sort through the wonders. Open every day from 11am-8pm until Christmas Eve. 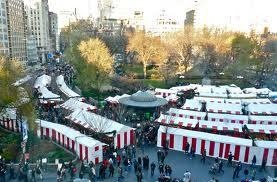 Just behind the New York Public Library at 42nd Street is Bryant Park’s Holiday Market. This market is sprawling with more than 125 booths from around the world. It’s a bit different from other locales because it draws holiday visitors for reasons other than shopping as well. Manhattan’s only free ice skating rink is here and there’s also a gorgeously lit Christmas tree. The rushing crowds make it clear that you’re in the heart of midtown, just inches away from jam-packed Times Square. You’ll definitely want to stop by my favorite vendor Max Brenner, Chocolate by the Bald Man to grab some energizing pralines. Open 11am-8pm during the week and 10am-9pm Saturday and 10am-6pm Sunday. Further uptown is the Columbus Circle Market which sits at the corner of Central Park South and Central Park West. A bit more scattered than the other two markets, this one has lots of interesting booths including handmade games, handcrafted accessories, gingerbread houses, apple cider, clothing, and gorgeous jewelry laid out in pathways perpendicular to one another. I picked up a gorgeous necklace at Over the Moon Jewel . Barbara Wilkinson has an amazing touch with gemstones and is willing to customize to your taste. I had met her at the Mark’t in Madison Square Park in October. And one of my favorite Upper East Side Mexican restaurants, Cascabel , (yup, I reviewed that one, too) will keep you warm with their spicy carnita tacos. Like its Union Square sibling, this year’s Columbus Circle Market offers the services of a Market Concierge. I didn’t see her when I was there, but I could definitely have used her help. Open every day from 10am-8pm until Christmas Eve.